Philips HP6576 Deluxe Epilator - One of the Best Out There! This is the first epilator I have reviewed that elicited an audible reaction when I saw it. There is no question that this device is beautiful and, consequently, it makes you feel beautiful when you are the philips hp6576 deluxe. In a hurry ? >> Look at discounted prices on amazon. The Philips HP6576 also one of the more expensive epilators, so let’s take a look at its features, benefits, where to buy it and accessories to see if it’s worth the you buying this epilator for hair removal. If you are cool with staying let’s get into the detailed benefits below! The more tweezers an epilator has, the more effective it can be. Thirty-two is not the highest I have ever seen, but it is still a decent number. The tweezers are ceramic, not metal, so they do not rust or bend and makes epilating with the Philips HP6576 Satin Perfect Deluxe a completely safe process. The ceramic also makes this device hypo-allergenic. Instead of metal tweezers, the Philips HP6576 has textured ceramic discs that gently grip and remove even the finest hairs directly from the root. The Philips HP6576 has an active hairlifter, meaning that the device vibrates in order to raise even the finest hairs to prime them for epilation. Many epilators have discs on the sides that glide into the hairs to push them upright, but having a vibrating piece that does this is much more efficient and, frankly, brilliant! The Philips HP6576 also has something called a stretch bar. When epilating, it is important to pull the skin taught so that you don’t pinch your skin or miss any hairs. Well, instead of needing to use your free hand for this job, the Philips HP6576 does it for you. The stretch bar lays your skin flat as the ceramic tweezers are coming, which prevents the device from pinching and also helps prepare the hairs for epilation. Epilating is not the most pleasant experience and many companies are making epilators with systems that make it a less painful job. The Philips HP6576 has a massage system that stimulates and soothes the skin so that the pores more easily release the hair roots. The tighter the pores hang on to the roots, the more painful the experience will be. Therefore, make sure you are moisturizing in the days prior to epilating (do NOT moisturize directly before epilating – the skin must be clean of all oils or gels), it helps if you take a warm shower beforehand to open up the pores, and starting with the first speed setting can help as well. The Philips HP6576 has two speed settings. The first setting is a slower speed that is more gentle and the second setting is a faster (and louder) setting for more efficient epilation. Consumers are of two schools of thought here: some say that the slower speed is, indeed, more gentle and easier to use as a beginner, but others say that the higher speed hurts less and takes less time (sort of like ripping the band-aid clean off rather than a little at a time). It is really up to you as to which you prefer, but purchasing an epilator with the choice is the best case scenario, rather than purchasing one that only has one speed and you are just stuck with what you get. The human body is full of curves, awkward places to reach, and bumpy areas. In order to keep the most contact with the skin at all times, Philips has made this model with a pivoting head that contours perfectly to every inch of the body. The most difficult spots, I think, are around the ankles and over the knees. With this pivoting head, though, you’ll get every hair and avoid those embarrassing tufts of missed spots that you only notice after the fact. You will also avoid those tiny, but super painful, cuts that razors give you in those tough spots. If you are in a hurry and do not have time to read this detailed review you can jump right over to amazon here to see customer reviews and discounted pricing. This is the coolest feature that a lot of epilators are including now. Without a spotlight, you are often forced to set up a secondary light source in order to see the very light or fine hairs that are so easily missed. When the spotlight is built-in, however, you have a very clear view of every hair and are able to do a very efficient job the first time around. The Philips HP6576 is a cordless unit, but it is NOT waterproof, so don’t use it in the shower. If you ask me, that is kind of a bummer. If you’re going to bother making the device cordless, why would you not go the extra step and make it shower-ready? In any case, you still won’t be glued to the outlet while using this epilator, which is great. It takes about an hour to charge and you get about forty minutes of use. This is the same timeframe across the board for cordless units. And one more plus about this particular model is that you CAN use the device while it is plugged in. Therefore, you don’t have to wait for it to charge if it takes you longer than forty minutes to finish grooming. Even though the Philips HP6576 is not shower-friendly, the head is washable. This helps keep everything clean and in top operation. Simply remove the head piece and wash the device under running water. The device also comes with a small brush you can use if you want to skip the water. Click Here to purchase the philips hp6576 on amazon for the best price. The Philips HP6576 comes with a portable pair of tweezers that has a light and a mirror. The HP6576 is not set up to handle sculpting perfect eyebrows and I was happy to see that Philips included these tweezers. The tweezers have an on-board spotlight all their own and come with a handheld mirror so that you can be sure you get every stray hair and sculpt perfectly arching brows that compliment your face shape. The Philips HP6576 also comes with a small travel pouch making trips and storage a breeze. You will also receive three head attachments: a shaver, a trimmer, and contour head. The shaver is to replace your regular razor, the trimmer is to trim down the places you don’t necessary want to rid of hair, and the contour head if for a more concentrated and closer epilation.Click Here to buy your hp576 on amazon at discounted pricing. 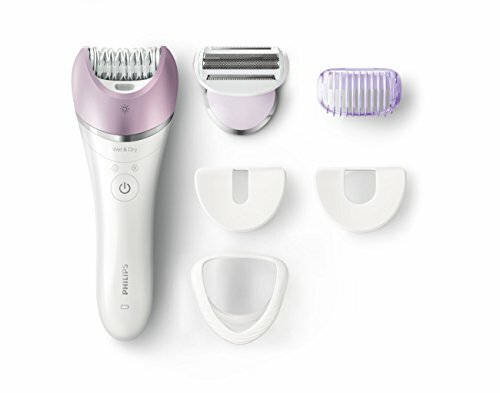 This is a beautiful and surprisingly efficient epilator that seems to be well worth its high price and will leave you with smooth skin for up to two weeks. It has all the popular features including a spotlight and multiple speed settings, and also comes with a bit more like the portable tweezers, ability to use while plugged in, and ceramic, hypoallergenic discs. Some of the less attractive features include not being able to use it in the shower, it doesn’t have a facial head attachment so you will have a hard time using it to trim facial hair, and even though it has a relatively small amount of ceramic tweezers, it ranks pretty high on the pain scale. It is, however, a contender in the world of complete hair removal systems. Click Here to buy your own philips hp6576 on amazon for discounted pricing.